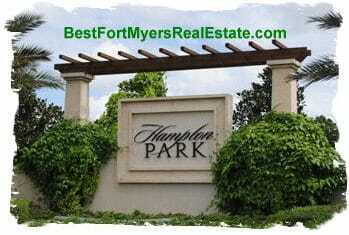 Hampton Park, Fort Myers Florida 33913 is located near the Boston Red sox Stadium and RSW Airport. At the center of the Hampton Park neighborhood is the Sports and Social Club. Even includes billiards. A fitness center and resort style pool adds all the amenities you need. Golf memberships currently available. You will love the lifestyle at Hampton Park in the award-winning community of Gateway Fort Myers.. This gated development of remarkable homes includes a broad choice of home floorplans to fit your budget and life. The Hampton Park Sports and Social Club, with its full fitness center and impressive resort pool, will become your new cherished place/ You can relax and enjoy your lifestyle and family. Your community clubhouse includes meeting spaces, billiards,locker rooms, and weight training. Aerobics equipment is also available. Sun decks surround the resort-style pool. A pavilion with fireplace and grills, a full-size basketball court and a children’s playground park. For young families and young-at-heart retirees, Hampton Park homes is your gateway to the best of Fort Myers. Nearby shopping and dining at Gulf Coast Town Center and Bell Tower Shops, and continuing education at Florida Gulf Coast University. Numerous additional amenities surround Hampton Park in the 3,000-acre Gateway Community. If you need more information about Hampton Park or other Fort Myers real estate, feel free to Contact Shellstar Realty. Our Realtors have many years experience and can help you obtain the best price on your real estate purchase! Click to view Fort Myers Gated Communities listings. Hampton Park Homes for Sale- Fort Myers MLS – Hampton Park Homes search!